Having sufficient funds on your domain is essential in ensuring babblevoice works. If you run out of funds, you will not be able to make outbound calls. Funds can be added to your account in different ways; you can set up a direct debit or add funds to your account using a credit card via Paypal or a PayPal account. We recommend you set up a direct debit to cover your costs but will go through all these options below. Please ensure that more than one person knows how to add funds to your domain in case of holiday, illness etc. 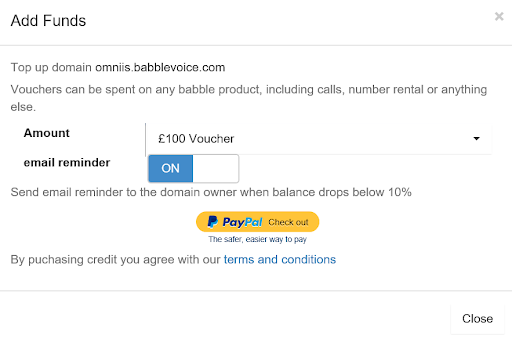 If you are paying by credit card/PayPal you do need to ensure there are sufficient funds on your babblevoice domain. Your monthly babblevoice services, such as number rental, are charged on the 1st of each month. We suggest you monitor your funds regularly. We have detailed the options below for you. Direct Debit and Paypal options are accessed through the financial bar on your babblevoice domain homepage. This is where you can add money to your domain in the form of one off payments. Funds can be added using a credit card via Paypal or a PayPal account. When you select “Add Funds” this you will see the following box. You can select the option to receive an email reminder at this point. Please be aware that the email reminder will be sent to the domain owner only. To add funds to your account via either PayPal or credit card, click on the yellow PayPal link. If you wish to pay by PayPal then log on following the instructions in the box. If you wish to pay by credit/debit card then scroll down this screen and click on the appropriate link to insert your details. If you cannot find your account details to log into babblevoice you can also use https://www.babblevoice.com/a/topup to go straight to the top up page. You will need to know your domain name though. Your bank or building society requires more than one signature to authorise this Direct Debit instruction or you are not the account holder. On completion of the form below you will be asked to download a copy of the Direct Debit instruction which must be signed by the account holder(s) and posted back to us. will enable you download a hard copy of the form to sign and return. The amount you choose for your Direct Debit will be the amount your account is topped up to each month, not the amount that will be collected each month. We suggest that when setting up your direct debit, you specify an amount greater (perhaps 20% greater) than your highest month which will ensure you have enough to cover busy periods. How do I know when I’m getting low on funds? We suggest that you monitor your funds regularly particularly when you are new to babblevoice and also during times of increased phone calls. Request email reminder when adding funds if you are paying by credit card. To add a rule to your domain, you will need to create a rule which states “When a call ends check the balance if it is below £?? then send an SMS to 077777777777 with the message ‘your babblevoice balance is low’. You will need to specify in the mobile phone number you wish to receive the message and the amount you want the rule to trigger sending the text message. What if we can’t add funds? If you find yourself in the position where you are unable to add funds ie the person with the credit card is not in today, then please contact support and we can apply a temporary overdraft to your domain. If we receive regular requests for an overdraft we will ask you to review how you are choosing to top up your domain and the amount.